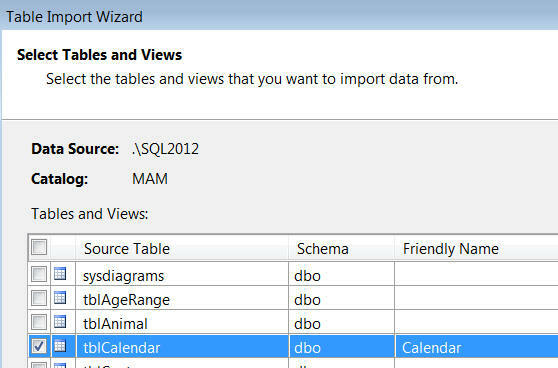 Creating a calendar table in SQL Server (or Excel). Importing this into your model. 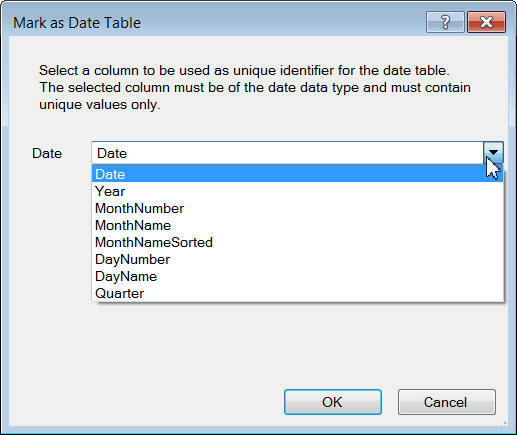 Telling SSAS Tabular which is your date table (!). Specifying how months should be sorted. 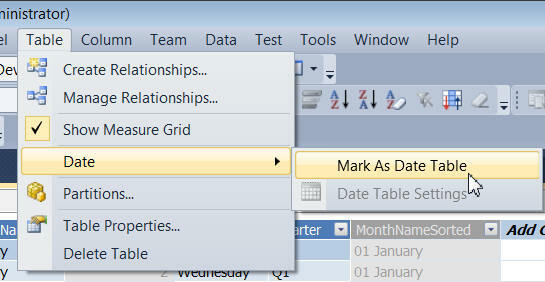 Creating relationships between your calendar and other date tables. Use your calendar fields in a pivot table. 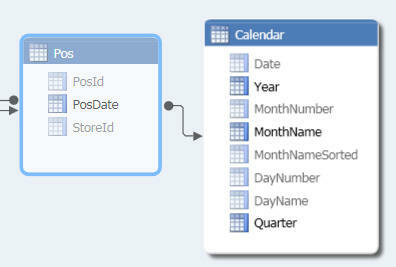 Let's start, then, with creating a calendar table, which you can then import into SSAS Tabular. 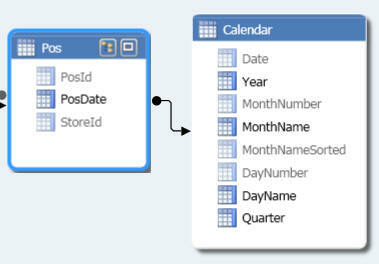 The easiest way to create a calendar table in SQL Server is to download, customise and run a stored procedure like this one. More information if necessary is given in this blog. 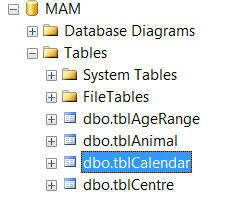 Running the stored procedure should generate a table like this in the MAM database. You need to know a bit about SQL to accomplish this, however. Alternatively, you could follow the instructions in this blog to create your calendar in Excel (the instructions are for PowerPivot, but would be the same for SSAS Tabular). Choose to import the calendar table like any other. You can do this in either data or diagram view. SSAS Tabular then suffers from a common-sense deficit. You have to tell it which of your fields uniquely identifies each date, even though it should be fairly obvious! Confirm that the Date column (at least in this table) contains unique dates for each row. You could repeat this trick for any column whose default sorting you want to alter. 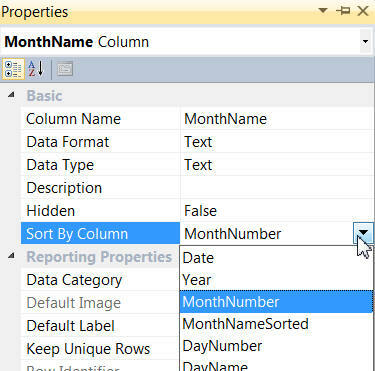 Choosing the MonthNumber column will ensure that months are sorted January to December, rather than alphabetically (which would have been the default). If you'd rather start with a different month, just create a new column in your calendar table, set the values for each date and sort by that instead. Click and drag the PosDate field from the Pos table onto the Date field for the Calendar table, to look up the calendar date for each point-of-sale record. Here we assume we'll only want to aggregate by month, quarter or year. The fields which you haven't hidden from client tools will appear in the list. Here we're summing by year, quarter and month. You can see summaries by year, quarter and month. 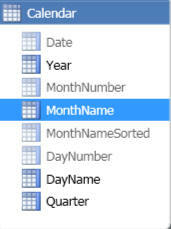 It's sometimes a good idea to set up a hierarchy, so that you can add the year/quarter/month combination in one go. Hierarchies will be covered in a later blog in this series. Finally for this blog, I'll show how you can create and use timelines for a pivot table to filter by date (similar to slicers, but requiring a calendar table to work).